Is honesty important for a car manufacturer? If you think it is, you may want to avoid Tesla Motors. This young company has just started delivering its first car (previous models were built by Lotus Cars, in England), but it failed to reveal one of its most important characteristics. Its weight. Because of their batteries, electric cars are always much heavier than gas cars. Weight is an important factor that any buyer should take in consideration, since weight affects handling and performance, and that is especially tricky with the Tesla model S, as this car has 3 weights depending on its battery. 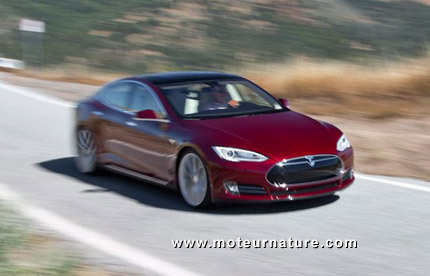 Base model S comes with a 40 kWh battery, with options for a 60 or a 85 kWh pack. We do not know the weight of each pack, but a conservative estimate would put the smaller battery at 750 pounds, with the big one probably over 1500 pounds (with the same energy density as the roaster’s battery). That’s a 750 pounds difference, and it could be even more than that because Tesla has designed an air suspension system for its heaviest car. Those are normally heavier than conventional springs, meaning the best model S could be over 5500 pounds! Buyers should be told the car’s weight because this Tesla model S, with the biggest battery, is the only one available for the time being. But Tesla’s wrong because on its website, it only gives the weight of its lightest model, the one with the smallest battery which will not be available before several months. Sorry to point it out, but the cars actually delivered to clients last month and this July, are much heavier than the 4647 pounds advertised. Tesla Motors should have the honesty to say so. Or is there a mistake somewhere? Many people would hope so. Nothing to worry about. That’s about the same weight as a Lexus LS hybrid.